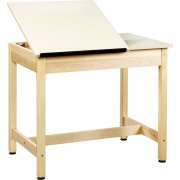 Buy Drafting & Art Tables for Your School or Company! What kind of tables are best for your art room? Drafting tables come in handy for a myriad of art and architecture applications. Their specialized design enables both students and professionals to work more accurately and comfortably. 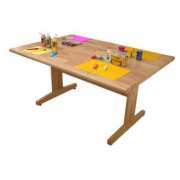 Art tables give novices and experts the space they need to create drawings and sketches. Hertz Furniture&apos;s selection of art tables includes both portable and stationary models. 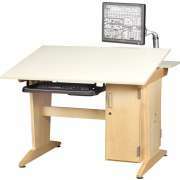 Our CAD drawing tables include convenient computer-friendly features that enable artists to utilize technology. Appropriate tables help artists and professionals focus on their work to improve the quality and quantity of output. What size art table should I get? 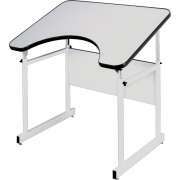 When choosing a drafting table, there are a number of factors that should be considered. Besides thinking about whether a stationary or portable model is preferable, the main consideration should be size. Firstly, you want to make sure that you can fit as many art tables as you need in the space you have allotted. The right number might depend on how many students you have in your largest drawing class or how many of your employees need sketching space at any given time. Size is not solely a function of space-arrangement and personnel. The appropriate surface size for an art table will depend on the size of paper that will be used. The workspace should be larger than the anticipated paper size so that even the edges can be utilized. A larger surface can also provide space for reference materials in addition to the drawing paper. 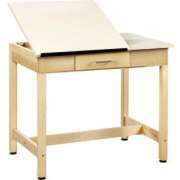 What kind of drawing table is best? Drawing tables come in a choice of materials. 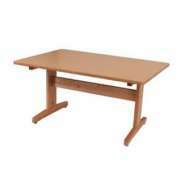 We have wooden tables as well as tables that are constructed with steel frames and high-pressure laminate tops. For easy and comfortable working, many of our tables feature surfaces with an adjustable angle. This enables the artist to set the tilt in the position which is most appropriate for sketching. Diversified Woodcrafts drafting tables have the natural appeal of solid wood legs with the functional convenience of adjustable-angle surfaces. 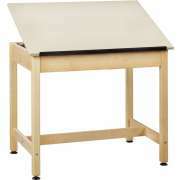 Some art drafting tables feature a full-surface tilt, while others have adjustable tilt on only part of the surface. The partial tilt is convenient because it enables the artist or architect to place reference materials, pencils and other necessary items on a flat surface where they won&apos;t interfere with the sketching process but are still close at hand. 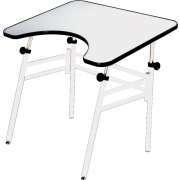 Which tables are best for CAD drawing? If your engineering firm or technical school is utilizing or teaching computer-aided design, our CAD drawing tables will make an excellent addition to your work space or studio. 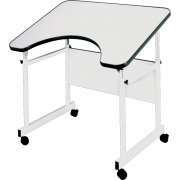 These user-friendly drafting tables feature great technological features that support your computer for easy-viewing. They include a CPU tray, monitor arm, keyboard tray and cable manager, so you can easily hook up a desktop without losing any space on the work surface. How can I make my art room wheelchair accessible? For a design that is a bit more flexible, try Mayline drafting tables. These adjustable-angle tables offer the same custom tilt angle as stationary drafting tables, with the added convenience of easy transport. They fold for easy storage and are the ideal choice for an institution that wants to provide equal comfort for all employees and students, as they are ADA compliant. While an adjustable angle is quite helpful for drawing comfortably and accurately, it is not the only feature that can enhance an artist&apos;s experience. Some of our art drafting tables feature the added bonus of built-in drawers. Rather than rummaging around to find all necessary supplies at the beginning of each day or project, drawers provide an easy-to-reach space for pencils, charcoals, erasers and other necessary supplies. Wood drafting tables with user-friendly features can greatly impact the experience of an artist, no matter what their skill level is. Hertz Furniture&apos;s adjustable drafting tables and art tables come in a selection of sizes and styles, so you can choose the option that best suits your space and purposes. Contact the Hertz Design Center to start planning out your ideal workspace and finding the perfect drawing tables to fill it with.